An Ohio father who made his daughter walk five miles (8km) to school as punishment for bullying has provoked a debate on parenting. After 10-year-old Kirsten was suspended for three days from the school bus for a second-time bullying offence, Matt Cox decided to teach her a life lesson. He made her trudge to school on a cold day while he followed behind in a car. The video of the father's punishment has garnered over 15m views on Facebook and thousands of comments. 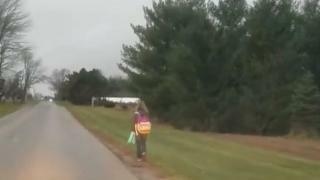 In the viral clip, Mr Cox's daughter is seen walking alongside a road, carrying a backpack and school supplies, in 2C (36F) temperatures. Mr Cox follows behind her in his car in the town of Swanton, offering commentary on entitlement and bullying. "Bullying is unacceptable," he said. "This is my small way of trying to stop it in my household." "I know a lot of you parents are not going to agree with this and that's alright," he says. "I am doing what I feel is right to teach my daughter a lesson and to stop her from bullying." In a Facebook update shared on Wednesday, Mr Cox said his daughter had taken his words to heart. According to WTVG News, Mr Cox broke up Kirsten's walk over her three-day school bus suspension this week. The 10-year-old told WTVG she herself had been bullied and now knows to be kind. Many of the 63,000 comments that have since popped up on his video have been positive, with parents of bullies and bullied alike thanking Mr Cox for his parenting. "As the grandparent of an autistic boy who has been the victim of neighbourhood bullies, I applaud you! Too many parents do nothing," read one reply. Read another: "Wish more parents took the time to hold their children accountable for unacceptable behaviour." However, others pointed out that by shaming her with the punishment video, the girl was arguably being bullied by her father. "Humiliate her by putting her on Facebook being punished. Irony," one user commented. "Ok but wait, is she bullying other kids or did you stop to hear her explanation?" said another. "Was she reacting to being bullied and just got caught? If public shaming is your idea of punishment no wonder she's acting out." Prof Dorothy Espelage of the University of Florida, a psychology researcher and expert on youth bullying, told the BBC it is far more common for parents of bullies to not admit their child is in the wrong. "So in some ways, this father is doing the right thing of admitting and accepting his daughter's behaviour," she said. Prof Espelage says that children are less likely to act out if behaviours have consequences, but she would suggest a different approach than walking in the cold. "I, like many of the folks who commented on the video, would like to know more about the bullying, the origins." We asked BBC readers to tell us what they thought of Mr Cox's parenting strategy. "There has to be ongoing conversations about bullying and the impact it has," Prof Espelage added. "This type of punishment is short-term and will not address the culture in the school or on the bus that is lending itself to bullying." Mr Cox told News 5 Cleveland that he had shown Kirsten and his two other children the video and people's comments on it. They "seem to show a great deal of empathy towards some of the sad stories that I read with them," Mr Cox said. He added that he hoped parents would "start holding their kids accountable".